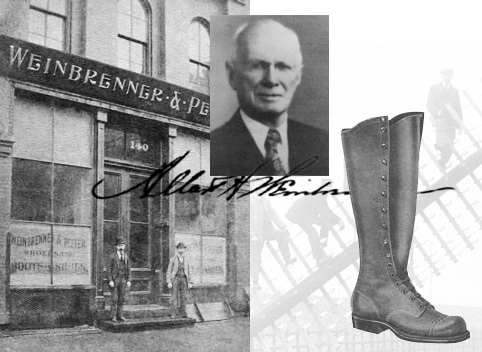 Albert Weinbrenner (age 27), starts a business with partner Joseph Pfeifer repairing and selling boots and shoes out of a storefront at 140 West Water Street in Milwaukee. - they called their new cobblery "Weinbrenner and Pfeifer." Their specialty - boots and shoes for the "jobbing" trades - to use modern terms, they specialized in work boots. Albert's first job-fitted boots were designed for the growing new trade of telephone line installation that required workers to shimmy up something called a telephone pole - in response, Albert designed and manufactured the first 16" lineman boots. The new boot style allowed linemen to wrap their legs around the pole to steady their position while working. Now known as style 804-4254, this innovative "jobber" boot is still in production.